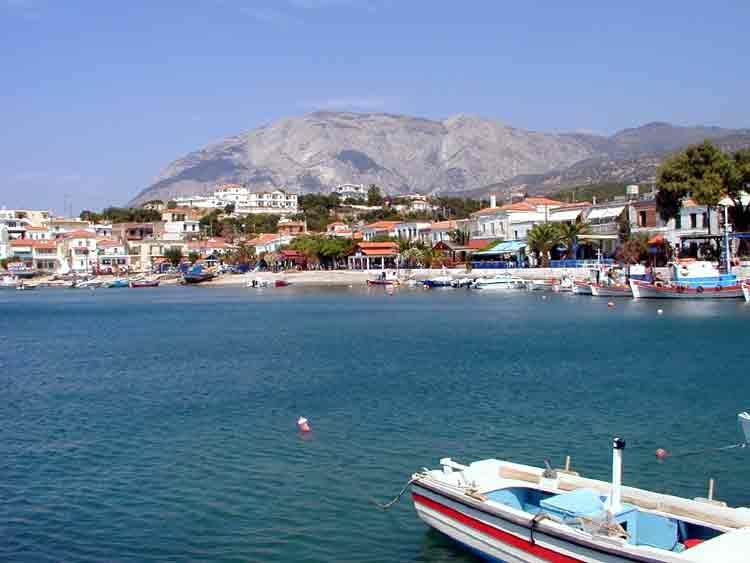 We had another hot day for our trip around Samos and were glad to have air-conditioning in the hire care. The west and north coasts of the island are lovely. The west is quite isolated with just a few scattered villages and sometimes stunning scenery. The north is more cultivated and wooded, as well as having some tourist development along the wind-swept coast. The south of the island has suffered a lot from forest fires but also has some pretty villages and scenery, apart from the airport and touristy beaches. Pithagorio is a pretty town, overrun with tourists but not tacky like Skiathos, and fun for a leisurely drink or meal watching the world go by. The not-yet-finished marina provided reasonable shelter but we were keen to move on, having stocked up with provisions using the hire car. The forecast on Wednesday was for strong winds so we decided to head out to sea and go where the wind took us. Now that the Meltimi (northerly winds) have established themselves for the high summer, that means east, west or south. We ended up going west to Fourni island and sailed most of the way in F5-6. The wind kept dropping from time to time, leaving the boat to wallow in lumpy seas for 10 minutes or so then picking up again just when we'd decided to shake out the reefs in the mainsail or turn on the engine. 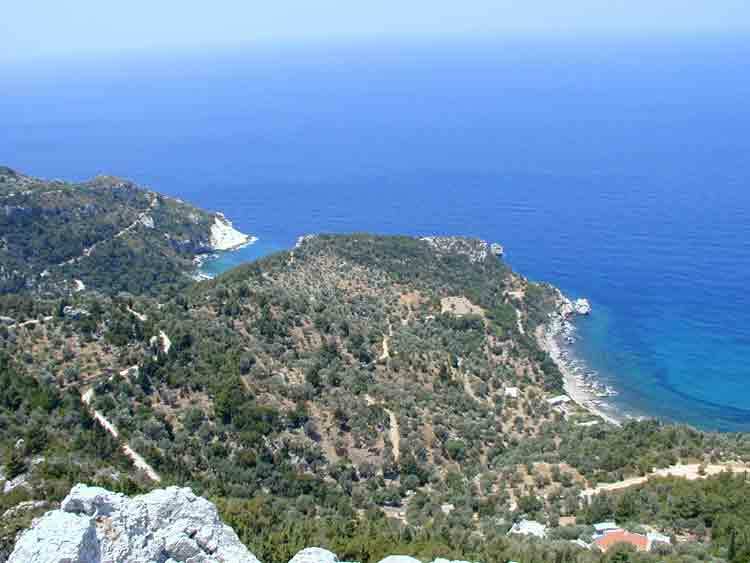 Fourni is part of a group of islands and islets, mostly uninhabited, lying just south of the gap between Samos and Ikaria. They are recommended as places to visit that are unaffected by tourism. Ikaria is similarly recommended. Perhaps the reason for their lack of tourism is that they are also very windy places. We spent two nights in a small cove on the south of the Fourni, with the wind gusting up to 40kts on the first night. By Friday, the forecast for the area was still predicting strong winds a force higher than further east so we decided to give up on exploring more of Fourni and Ikaria. This was a pity because the fishing is reported to be good there. Maybe that's because the fishermen find it too windy there too? On Friday we sailed east again to the little island of Agathonisi, our first landing in the Dodecanese. Predictably the wind lessened as we moved east and again we experienced temporary holes in the wind, but we managed to sail most of the way. At Agathonisi we found the anchorage around the little harbour quite full so instead we anchored off a nearby beach, a short walk from the harbour, managing to squeeze in front of another yacht. We've found the holding very good so far in this area as long as we avoid the weedy patches, but sometimes the anchor drags a bit in the sand, so we don't end up where we expected. After a couple of goes we got where we wanted by dropping the anchor closer in, allowing for some drag. The temperature was up to 33 degrees by the time we arrived so we were glad of a swim in lovely cool, clear water. Soon after we arrived a freighter came in (to the ferry berth in the harbour) and proceeded to offload sand and aggregate for road-building. We were glad to be away from that. We stayed at Agathonisi 2 nights, eating out at 2 of the tavernas around the harbour. Both were excellent, serving delicious goat stew (which seems to be an Eastern Aegean speciality). Yesterday we set of early for a walk to the two villages closest to the harbour (Big Village and Little Village). We only got as far as Little Village as the heat was too much for us, and we ended up back down at the harbour enjoying a cooling drink in a shady cafe, watching the lorries shuttle to and fro from the freighter. The temperature now is too hot for serious sight-seeing! The harbour emptied out quite a bit during yesterday morning but by the evening, after the freighter had gone, it was even fuller. Today we sailed west again to another little island, called Arki. The wind was mostly F5 and we saw little other shipping other than the odd cruise ship or container ships. However, once we got here we found the anchorages busy with both charter yachts, weekenders and liveaboard yachties like us. Being July, and weekend, it's inevitable that these places will be busy. It's getting more like musical chairs by the day, with everyone moving on in the morning and racing to the next anchorage in hope of getting pole position. When we arrived today we found what we thought was a good spot in one of the anchorages but after trying at least 6 times to get the anchor to dig in and failing we gave up. We're now in a deeper anchorage, lying in 6-8 metres of water rather than 4-5, and the wind is blowing quite strongly again. The wind is always stronger around the islands than out to sea, even around the smaller islands. And, it's not consistent, sometimes dropping for a few minutes then gusting strongly again.